This new Christmas Tree is worked on 14-count aida. 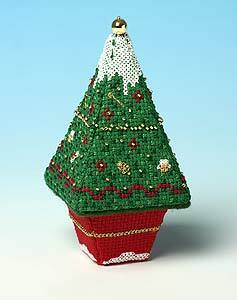 The Snow Tree cross-stitch kit by Meg Evershed allows you to make a beautiful little 3d tree with embroidered ornaments and a layer of snow on top. When finished the tree stands approximately 12 cm high. The kit includes 14 count Aida fabric, felt, stranded cotton embroidery thread, beads, plastic canvas shapes, needles, chart and full instructions.